Note: Payment fulfillment by Whole Foods. Give InKind has an affiliate relationship with many of the advertisers on our site, and may receive a commission from products purchased via this link. Whole Foods Market is the leading natural and organic food retailer. 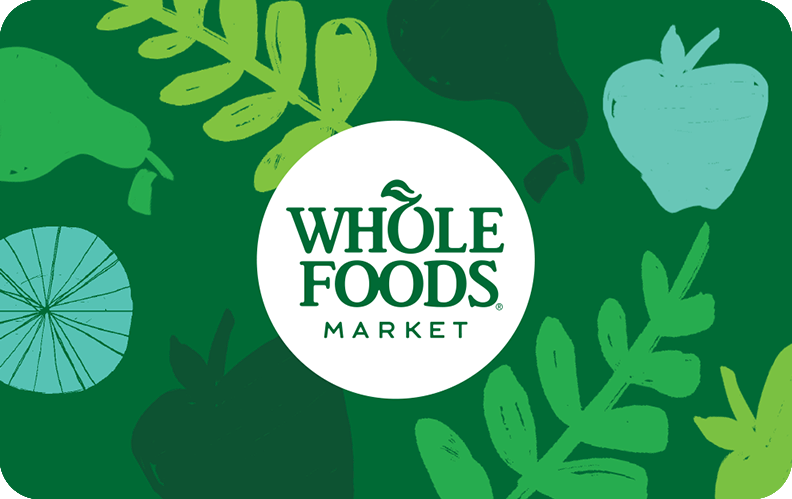 Whole Foods Market gift cards never expire and can be redeemed at any location. Learn whether your recipient lives near a Whole Foods Store using this store locator. The available balance will be applied toward the purchase from soup to nuts. Whole Foods Market gift cards may be used at all Whole Foods Market stores in the United States and Canada. Why We Love This Gift: Whole Foods is a veritable cornucopia of outstanding food - fresh and delicious. Editors at Give InKind love nothing more than a wander through the aisles of perfectly ripe cheese, succulent fruit, organic meat and more. Whole Foods has terrific pre-made options which are a great gift for families needing to spend time in hospitals, for busy families on the go - and more. A contributor remembers the months she spend trying to stay healthy herself as the nursed her daughter through in-hospital pediatric oncology care. Healthy options helped a great deal. What To Express in Your Card: I want you to take care of yourself. I want to help.